I spent about an hour and a half going through my bags of unsorted snapshots looking for a particular photo that I wanted to post. I never found it, but I found this one, and I like it. There’s an A. A. Milne quote that goes, “One of the advantages of being disorganized is that one is always having surprising discoveries.” So true, so true. As for this photo, I wish I knew where these folks are. They don’t seem equipped for serious mountaineering, and yet we are left with the impression that this location required some hiking. Do you suppose that square of white is a sketch pad? If they were seeking a magnificent vista, they seemed to have found one. Yes, it looks like a sketch pad to me, and I am guessing, based on their attire, that it was a casual hike. Thanks, Mike. It looks like it was a nice outing. Dang! How does one casually get to a majestic spot like that? Sign me up. Yes, I was wondering the same thing. I guess it’s possible this spot is just a few yards from some scenic vista car park, but I get the sense this involved more of a hike than that. And not just a woman, but apparently a man of color (who appears to be along as a friend, not a sherpa). I find it pleasantly surprising to see such a combination from back then. The gentleman of color looks like he might be Indian of Pakistani. Yes, I was thinking the same thing. 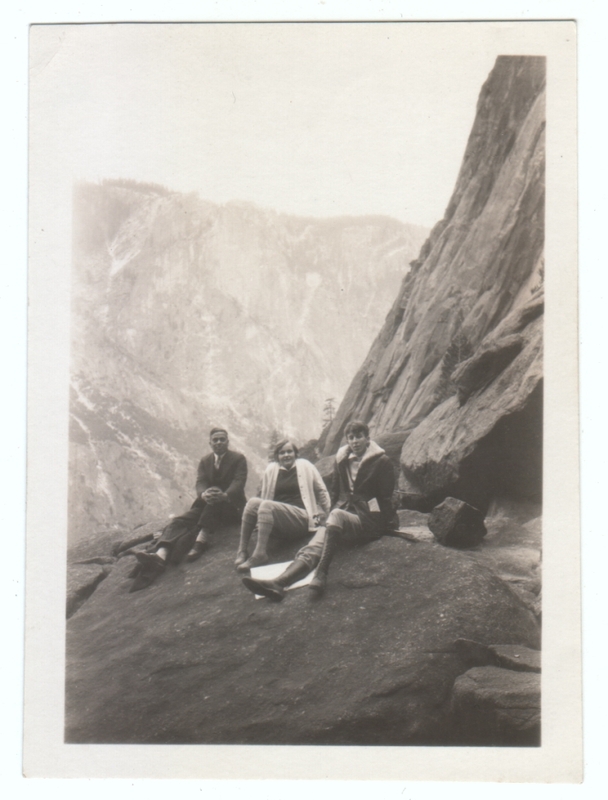 For all I know these could be the Himalayas, but my guess is that they are all college friends on an outing in the U.S. or Canada, and he is the foreign student being shown the regional sights, though such assumptions could easily be way off base. I was thinking he was a college professor and the two were his students. That’s a good guess, too.